Leslie Robertson, a member of the engineering firm that designed the Twin Towers, said: “As of 21 days after the attack, the fires were still burning and molten steel was still running” (Williams, 2001). Knight-Ridder journalist Jennifer Lin, discussing Joe “Toolie” O’Toole, a Bronx firefighter who worked for many months on the rescue and clean-up efforts, wrote: “Underground fires raged for months. O’Toole remembers in February seeing a crane lift a steel beam vertically from deep within the catacombs of Ground Zero. ‘It was dripping from the molten steel,” he said'” (Lin, 2002). Greg Fuchek, vice president of sales for LinksPoint, Inc., which supplied some of the computer equipment used to identify human remains at the site, described the working conditions as “hellish,” partly because for six months, the ground temperature varied between 600 degrees Fahrenheit and 1,500 degrees or higher. Fuchek added that “sometimes when a worker would pull a steel beam from the wreckage, the end of the beam would be dripping molten steel” (Walsh, 2002). And still more witnesses spoke of molten steel. According to the official account, the “pancaking” began when the floors above the hole caused by the airplane fell on the floors below. 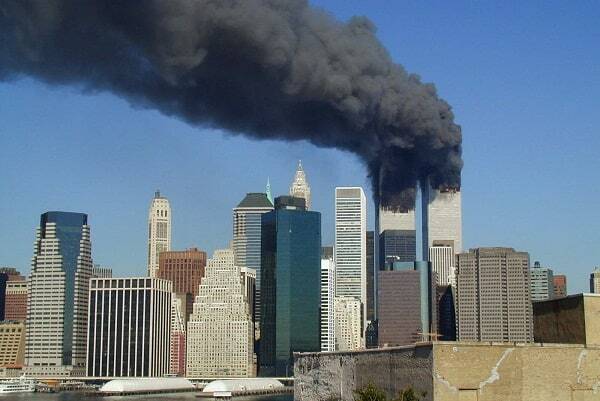 Some witnesses reported, however, that the collapse of the south tower began somewhat lower. Why Does the Public Not Know of These Reports? If all these firefighters and medical workers witnessed all these phenomena suggestive of controlled demolition, it might be wondered why the public does not know this. Part of the answer is provided by Auxiliary Lieutenant Fireman Paul Isaac. Having said that “there were definitely bombs in those buildings,” Isaac added that “many other firemen know there were bombs in the buildings, but they’re afraid for their jobs to admit it because the ‘higher-ups’ forbid discussion of this fact” (Lavello, n.d.). Another part of the answer is that when a few people, like Isaac and William Rodriguez, have spoken out, the mainstream press has failed to report their statements. Both lectures are also available on DVDs edited by Ken Jenkins (kenjenkins@aol.com). See also Griffin, 2005c. Leslie Robertson, who was a member of the firm (Worthington, Skilling, Helle and Jackson) that was responsible for the structural design of the Twin Towers, said that the Twin Towers were designed to withstand the impact of a Boeing 707, at that time (1966) the largest airliner. See “The Fall of the World Trade Center,” BBC 2, March 7, 2002 (http://www.bbc.co.uk/science/horizon/2001/worldtradecentertrans.shtml). For a comparison of the 707 and the 767, see “Boeing 707-767 Comparison,” What Really Happened (http://www.whatreallyhappened.com/boeing_707_767.html). Also relevant is the fact that in 1945, a B-25 bomber struck the Empire State Building at the 79th floor, creating a hole 20 feet high. But there was never the slightest indication that this accident would cause the building to collapse (see Glover, 2002). Stating this obvious point could, however, be costly to employees of companies with close ties to the government. On November 11, 2004, Kevin Ryan, the Site Manager of the Environmental Health Laboratories, which is a division of Underwriters Laboratories, wrote an e-mail letter to Dr. Frank Gayle, Deputy Chief of the Metallurgy Division, Material Science and Engineering Laboratory, at the National Institute of Standards and Technology (NIST). In this letter, Ryan stated: “We know that the steel components were certified to ASTM E119. The time temperature curves for this standard require the samples to be exposed to temperatures around 2000°F for several hours. And as we all agree, the steel applied met those specifications. Additionally, I think we can all agree that even un-fireproofed steel will not melt until reaching red-hot temperatures of nearly 3000°F. Why Dr. Brown would imply that 2000°F would melt the high-grade steel used in those buildings makes no sense at all.” After Ryan allowed his letter to become public, he was fired. His letter is available at http://www.septembereleventh.org/newsarchive/2004-11-11-ryan.php. The fire theory is rendered even more unlikely if the first two characteristics are taken together. For fire to have induced a collapse that began suddenly and was entirely symmetrical, so that it went straight down, the fires would have needed to cause all the crucial parts of the building to fail simultaneously, even though the fires were not spread evenly throughout the buildings. As Jim Hoffman has written: “All 287 columns would have to have weakened to the point of collapse at the same instant” (“The Twin Towers Demolition,” 9-11 Research.wtc7.net, n.d., http://911research.wtc7.net/talks/towers/slides.html). The RDX quotation is in Tom Held, ‘Hoan Bridge Blast Set Back to Friday,’ www.jsonline.com (Milwaukee Journal Sentinel), Updated Dec. 19, 2000 (http://www.jsonline.com/news/metro/dec00/hoan20121900a.asp). The DREXS quotation is in Hufschmid’s video, “Painful Deceptions” (www.EricHufschmid.Net). This article in Popular Mechanics is, to be blunt, spectacularly bad. Besides the problems pointed out here and in note 11, above, and note 39, below, the article makes this amazing claim: “In the decade before 9/11, NORAD intercepted only one civilian plane over North America: golfer Payne Stewart’s Learjet, in October 1999.” In reality, as genuine 9/11 researchers know, the FAA reported in a news release on Aug. 9, 2002, that it had scrambled fighters 67 times between September 2000 and June 2001, and the Calgary Herald (Oct. 13, 2001) reported that NORAD scrambled fighters 129 times in 2000. By extrapolation, we can infer that NORAD had scrambled fighters over 1000 times in the decade prior to 9/11. The claim by Popular Mechanics could be true only if in all of these cases, except for the Payne Stewart incident, the fighters were called back to base before they actually intercepted the aircraft in question. This is a most unlikely possibility, especially in light of the fact that Major Mike Snyder, a NORAD spokesperson, reportedly told the Boston Globea few days after 9/11 that “[NORAD’S] fighters routinely intercept aircraft” (Johnson, 2001). In June of 2002, NBC television played a segment from tapes recorded on 9/11 that contained the following exchange involving firefighters in the south tower:Official: Battalion 3 to dispatch, we’ve just had another explosion.Official: Battalion 3 to dispatch, we’ve had additional explosion.Dispatcher: Received battalion command. Additional explosion (“911 Tapes Tell Horror Of 9/11,” Part 2, “Tapes Released For First Time”, NBC, June 17, 2002 [www.wnbc.com/news/1315651/detail.html]). Romero, it is true, changed his public stance 10 days later, as announced in Fleck, 2001. But this is not a convincing retraction. “Subsequent conversations with structural engineers and more detailed looks at the tape,” according to this article, led Romero to conclude that “the intense heat of the jet fuel fires weakened the skyscrapers’ steel structural beams to the point that they gave way under the weight of the floors above.” But there is no indication as to what any structural engineer said, or what Romero saw in his “more detailed looks at the tape,” that led him to change his earlier view that the collapses were “too methodical” to have been produced by anything except explosives. There is no suggestion as to how weakened beams would have led to a total collapse that began suddenly and occurred at virtually free-fall speed. Romero has subsequently claimed that he did not change his stance. Rather, he claimed that he had been misquoted in the first story. “I was misquoted in saying that I thought it was explosives that brought down the building. I only said that that’s what it looked like” (Popular Mechanics, 2005). But if that is the truth, it is strange that the second story, written by Fleck, did not say this but instead said that Romero had changed his mind. Romero clearly did change his mind—or, to be more precise, his public stance.A clue to the reason for this change may be provided by another statement in the original article, which said that when the Pentagon was struck, “[Romero] and Denny Peterson, vice president for administration and finance [at New Mexico Tech], were en route to an office building near the Pentagon to discuss defense-funded research programs at Tech” (Uyttebrouck, 2001). Indeed, as pointed out in a later story on the New Mexico Tech website (“Tech Receives $15 M for Anti-Terrorism Program” [http://infohost.nmt.edu/mainpage/news/2002/25sept03.html]), the December 2003 issue of Influence magazine named Romero one of “six lobbyists who made an impact in 2003,” adding that “[a] major chunk of [Romero’s] job involves lobbying for federal government funding, and if the 2003 fiscal year was any indication, Romero was a superstar,” having obtained about $56 million for New Mexico Tech in that year alone. In light of the fact that Romero gave no scientific reasons for his change of stance, it does not seem unwarranted to infer that the real reason was his realization, perhaps forced upon him by government officials, that unless he publicly retracted his initial statements, his effectiveness in lobbying the federal government for funds would be greatly reduced. Romero, to be sure, denies this, saying: “Conspiracy theorists came out saying that the government got to me. That is the farthest thing from the truth” (Popular Mechanics, 2005). But that, of course, is what we would expect Romero to say in either case. He could have avoided the charge only by giving a persuasive account of how the buildings could have come down, in the manner they did, without explosives. Even if we were generous to a fault and allowed that there might be as high as a 1-in-10 chance (a chance much higher than 1-in-100, or 1-in-500) that any one of the 11 features could occur without explosives, the chance that all 11 of them would occur together would be one in 100 billion. (This calculation with its very generous assumption of 1-in-10 does assume the 11 are independent of each other. For more completeness, if only 6 were independent while 5 were correlated to others, we would still have one chance in a million. Yet, if the chance were 1-in-100 and each is independent, we would have one chance in ten-to-the-22nd-power. )Were we to also add in the probability that all these features would occur in three buildings on the same day, the probability would become so vanishingly small that it would be hardly distinguishable from zero.On the other hand, if explosives were used in the buildings, there would be a high probability that all 11 features would have occurred in all three buildings. For this argument, I am indebted to James Fetzer, who—through his essay “‘Conspiracy Theories’: The Case of 9/11”—inspired it, and to Paul Zarembka, who helped with the final formulation. Imagine a massive steel cable, lowered from a tall crane, firmly secured to the middle of the uppermost (110th) floor of one of the towers.Now, imagine that this floor were somehow decoupled from the rest of the structure beneath it.Summon your personal genie and have him make all 109 floors and supporting structures beneath this now-supported slab magically disappear.What we now have is our concrete floor slab dangling 1,350 feet up in the sky, suspended by a cable from our imaginary crane.Now, have your genie cut the cable.Your 110th floor would now freefall through the air and impact the ground in about 9 seconds (which is about how long it took for the top floors of both towers to reach the ground).Now, imagine a variation of this scenario: We will notdecouple the top floor nor dabble with a crane.Instead, we shall ask our genial genie to magically “soften” all the supporting columns of the lower 109 floors.Wouldn’t every one of these floors and their now-softened supporting structures immediately begin to buckle under the weight of the 110th floor?Wouldn’t this buckling significantly slow down the descent of the top floor by continuing to offer a degree of resistance to its descent?Wouldn’t these progressive viscous “arrests”—-the sagging steel aided by ripping rivets, shearing bolts and tearing welds—-slow down the top floor’s fall significantly?Wouldn’t this cause the top floor to take a lot longer than 9 seconds to eventually reach the end of its descent and come to rest atop the crushed pile of floors beneath it?But on September 11, 2001, every floor, of every tower, fell as though nothing existed below it but air.For that to happen, every supporting (i.e., resisting) column beneath every collapsing floor would have had to have been taken out of the way.Only well-placed explosives can do that.This is what happens in a controlled demolition. The official investigators found that they had less authority than the clean-up crews, a fact that led the Science Committee of the House of Representatives to report that “the lack of authority of investigators to impound pieces of steel for examination before they were recycled led to the loss of important pieces of evidence” (http://www.house.gov/science/hot/wtc/charter.htm). “Baosteel Will Recycle World Trade Center Debris,” Eastday.com, January 24, 2002 (http://www.china.org.cn/english/2002/Jan/25776.htm). For visual evidence, see Hoffman, “North Tower Collapse Video Frames: Video Evidence of the North Tower Collapse,” 9-11 Research.wtc7.net, n.d. (http://911research.wtc7.net/wtc/evidence/videos/wtc1_close_frames.html). For Giuliani’s complete statement, see “Who told Giuliani the WTC Was Going to Collapse on 9/11?”, What Really Happened, n.d. (http://www.whatreallyhappened.com/wtc_giuliani.html); it can be heard at www.wireonfire.com/donpaul. In “A Brief History of New York City’s Office of Emergency Management,” we read: “1996: By executive order, the Mayor’s Office of Emergency Management is created. The Director reports directly to the Mayor, and serves as the local Director of Civil Defense” (http://www.nyc.gov/html/oem/html/other/oem_history.html). For photographs and discussion, see Hufschmid, 2002, pp. 62-65, and the section entitled “The ‘Raging’ Fires at WTC Tower Seven” in “The World Trade Center Fires (Not So Hot Eh? ),” Global Research, September 27, 2004 (http://globalresearch.ca.myforums.net/viewtopic.php?t=523). Hufschmid, 2002, p. 64. The collapse of building 7 also had all the other features of conventional demolitions, such as beginning suddenly and then going down at virtually free-fall speed—which in this case meant under 7 seconds. This similarity to conventional implosions was commented on by Dan Rather. Showing a video of the collapse of building 7 on CBS that very evening, Rather said that it was “reminiscent of those pictures we’ve all seen too much on television before when a building was deliberately destroyed by well-placed dynamite to knock it down” (CBS News, September 11, 2001). Videos of the collapse of building 7, which have seldom appeared on mainstream television, can be viewed at various websites, including www.geocities.com/killtown/wtc7.html and www.whatreallyhappened.com/wtc7.html. Particularly good for this purpose is Eric Hufschmid’s DVD, “Painful Deceptions” (available at www.EricHufschmid.Net). Dwyer, in fact, wrote an article entitled “Vast Archive Yields New View of 9/11,” New York Times, August 13, 2005 (http://www.nytimes.com/2005/08/13/nyregion/nyregionspecial3/13records.html ?ex=1131339600&en=e619ef623287178f&ei=5070). But he did not mention the “new view” that would be suggested by the testimonies about explosions. Silverstein’s statement can be viewed (http://www.infowars.com/Video/911/wtc7_pbs.WMV) or heard on audio file [mp3-jplayer tracks=”http://911truth.org/911truthmedia/Audio/pull_it.mp3″ title=”Larry Silverstein: Pull It”] For a discussion, see Baker, n.d.
 Currid, incidentally, was re-elected president in 2002 (http://www.uniondemocracy.com/UDR/34-NYC%20Public%20Employees.htm). Baker, Jeremy, n.d. “PBS Documentary: Silverstein, FDNY Razed WTC 7,” Infowars.com (http://www.infowars.com/print/Sept11/FDNY.htm). Bollyn, Christopher, 2001. “Some Survivors Say ‘Bombs Exploded Inside WTC,’” American Free Press, October 22 (http://www.americanfreepress.net/10_22_01/ Some_Survivors_Say__Bombs_Expl/some_survivors_say__bombs_expl.html). __________, 2002. “New York Firefighters’ Final Words Fuel Burning Questions About 9-11,” American Free Press, August 9 (http://americanfreepress.net/08_09_02/New_York_Firefighters__/ new_york_firefighters.html). _____, 2005a. “9/11 and Chertoff: Cousin Wrote 9/11 Propaganda for PM,” Rumor Mill News, March 4 (http://www.rumormillnews.com/cgi-bin/archive.cgi?read=66176). _____, 2005b. “The Hidden Hand of the C.I.A. and the 9/11 Propaganda of Popular Mechanics,” American Free Press, March 19 (http://www.rense.com/general63/brutalpurgeofPMstaff.htm). Dwyer, Jim, and Ford Fessenden, 2002. “Lost Voices of Firefighters, Some on 78th Floor,” New York Times, August 4 (http://www.mishalov.com/wtc_lostvoicesfiredept.html). Emigh, Jacqueline, 2002. “GPS on the Job in Massive World Trade Center Clean-Up,” July 1 (http://securitysolutions.com/ar/security_gps_job_massive). FEMA (1988). “Interstate Bank Building Fire, Los Angeles, California” (http://www.lafire.com//famous_fires/880504_1stInterstateFire/ FEMA-TecReport/FEMA-report.htm). FEMA, 1991. “High-Rise Office Building Fire One Meridian Plaza Philadelphia, Pennsylvania” (http://216.239.59.104/search?q=cache:CHrKDNvrjsEJ:www.interfire.org/res_file/pdf/ Tr-049.pdf+High-Rise+Office+Building+Fire+One+Meridian+Plaza&hl=en&client=safari). FEMA, 2002. World Trade Center Building Performance Study, May (http://www.fema.gov/library/wtcstudy.shtm). Field, Andy, 2004. “A Look Inside a Radical New Theory of the WTC Collapse,” Firehouse.com, February 7 (http://cms.firehouse.com/content/article/article.jsp?sectionId=46&id=25807). Firehouse Magazine, 2002a. “WTC: This Is Their Story: Interview with Deputy Chief Peter Hayden,” April (http://www.firehouse.com/terrorist/911/magazine/gz/hayden.html). Firehouse Magazine, 2002b. “WTC: This Is Their Story: Interview with Captain Chris Boyle,” August (www.firehouse.com/terrorist/911/magazine/gz/boyle.html). Fleck, John, 2001. “Fire, Not Extra Explosives, Doomed Buildings, Expert Says,” Albuquerque Journal, September 21 (http://www.abqjournal.com/terror/anniversary/pmvan09-21-01.htm). Glanz, James, and Eric Lipton, 2002. “Towers Withstood Impact, but Fell to Fire, Report Says,” New York Times, March 29. Glover, Norman, 2002. “Collapse Lessons,” Fire Engineering, October (http://fe.pennnet.com/Articles/Article_Display.cfm ?Section=Archi&Subsection=Display&P=25&ARTICLE_ID=163411&KEYWORD=norman %20glover). _________, 2005b. “9/11 and the American Empire: How Should Religious People Respond?” 9/11 CitizensWatch, May 7 (http://www.911citizenswatch.org/modules.php? op=modload&name=News&file=article&sid=535). _____________, 2005c. “9/11 and the Mainstream Press,” 9/11 Visibility Project, July 29(http://www.septembereleventh.org/newsarchive/2005-07-29-pressclub.php). Hansen, Thomas, 2005. “Outrageous Conspiracy Theories: Report on a Conversation with Philip Zelikow,” 9/11 Visibility Project, June 7 (http://www.septembereleventh.org/newsarchive/2005-06-07-outrageous.php). Heller, David, 2005. “Taking a Closer Look: Hard Science and the Collapse of the World Trade Center,” Garlic and Grass, Issue 6, November 24 (http://www.garlicandgrass.org/issue6/Dave_Heller.cfm). Hoffman, Jim, 2003. “The North Tower’s Dust Cloud: Analysis of Energy Requirements for the Expansion of the Dust Cloud Following the Collapse of 1 World Trade Center,” Version 3, 9-11 Research.wtc7.net, October 16 (http://911research.wtc7.net/papers/dustvolume/volume.html). _____, 2004. 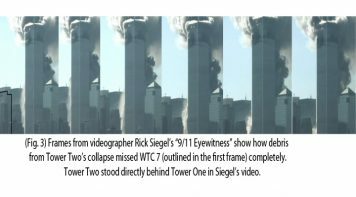 “Your Eyes Don’t Lie: Common Sense, Physics, and the World Trade Center Collapses,” 9-11 Research.wtc7.net (http://911research.wtc7.net/talks/radio/youreyesdontlie/index.html). Johnson, Glen, 2001. “Otis Fighter Jets Scrambled Too Late to Halt the Attacks,” Boston Globe, September 15 (http://nl.newsbank.com/nl-search/we/Archives?p_action=print). Killough-Miller, Joan, 2002. “The ‘Deep Mystery’ of Melted Steel,” WPI Transformations, Spring (http://www.wpi.edu/News/Transformations/2002Spring/steel.html). King, Jeff, 2003. “The WTC Collapse: What the Videos Show,” Indymedia Webcast News, November 12 (http://ontario.indymedia.org/display.php3?article_id=7342&group=webcast). Lane, B., and S. Lamont, 2005. “ARUP Fire’s Presentation regarding Tall Buildings and the Events of 9/11,” ARUP Fire, April 2005 (http://www.arup.com/DOWNLOADBANK/download353.pdf). Lin, Jennifer, 2002. “Recovery Worker Reflects on Months Spent at Ground Zero,” Knight Ridder, May 29 (http://www.messenger-inquirer.com/news/attacks/4522011.htm). Manning, Bill, 2002. “Selling Out the Investigation”, Fire Engineering, January (http://fe.pennet.com/Articles/ArticleDisplay.cfm ?Section=ARCHI&ARTICLEID=133237&VERSION NUM=1). NYT (New York Times), 2005. “The September 11 Records” (9/11 Oral Histories) (http://graphics8.nytimes.com/packages/html/nyregion/ 20050812_WTC_GRAPHIC/met_WTC_histories_full_01.html). Popular Mechanics, 2005. “9/11: Debunking the Myths,” March(http://www.popularmechanics.com/science/defense/1227842.html?page=1&c=y). PBS, 2002. “America Rebuilds” (http://www.pbs.org/americarebuilds). Samuel, Eugenie, and Damian Carrington, 2001. “Design Choice for Towers Saved Lives,” New Scientist, September 12 (http://www.newscientist.com/article.ns?id=dn1281). Szymanski, Greg, 2005a. “NY Fireman Lou Cacchioli Upset that 9/11 Commission ‘Tried to Twist My Words,’” Arctic Beacon, July 19 (http://www.arcticbeacon.com/articles/article/1518131/29548.htm). David Ray Griffin is Professor of Philosophy of Religion and Theology, Emeritus, at the Claremont School of Theology and Claremont Graduate University (1973-2004) and codirector of the Center for Process Studies. He edited the SUNY Series in Constructive Postmodern Thought (1987-2004), which published 31 volumes. He has written extensively on the topic of the 9/11 attacks. He has written more than 30 books, edited 13 books, and authored 250 articles and chapters.